“Yep, it’s a big hole. Can we leave now?” That was my response when our parents dragged my sister, brother, and me to the Grand Canyon on a family vacation. So every time friends visit us in the southwestern United States and say they want to go to the Grand Canyon, I’m dumbfounded. What’s the fascination with this big hole? I’m so glad I decided to give the Grand Canyon another try. It really is one of those extraordinary places on the planet where you find yourself in a constant state of awe. Majestic red canyon walls tower above you, reaching toward the deep blue skies. The bright green leaves of the cottonwood trees wave in the midday heat, providing a gentle breeze and shade from the sun. Refreshing pools of mesmerizing, clear water each have their own waterfall. Peace and serenity abound. But if it’s adrenaline-pumping adventure you seek, there is plenty of that for you, too. There are several ways to reach this captivating land. The quickest (and most expensive) is to take a helicopter. It’s a five-minute ride from the canyon rim to Havasupai Village. An alternative mode of transportation is by horse or mule. Mule packs are also available to carry your camping gear. A bit slower (but the only choice if you are into the whole gritty experience) is to hike in. It is 10 miles from the canyon’s rim to the campground. Much of the trek is in the sun, so most backpackers start early. There are five fantastic waterfalls. Upper and Lower Navajo Falls and Havasu Falls are found on the way to the campground. Mooney Falls and Beaver Falls are further down the canyon. Seven miles down the dusty path are the first two of the waterfalls — Upper and Lower Navajo Falls. For those who need to be revitalized, you can scramble up a ledge behind the 100-foot-wide Lower Navajo Falls and jump through the falls to the pool below. Reenergized and hiking further on the trail, you will soon hear the ominous rush of Havasu Falls before it comes into view. Havasu Falls is probably the most famous of the Havasupai waterfalls. Photo opportunities surround you; it would be difficult to take a bad photo here. This is an enchanting place to relax in the pools or enjoy the natural travertine slides in the water. For those who need a bit more of a thrill, you can climb to a ledge about halfway up the falls and jump into the refreshing 70-degree water below. But if you are anxious to get to the campground and set up camp, it’s very easy to come back here. It’s just a half mile from the campground. Nearby is a little stand where a Havasupai woman sells fry bread. She fries the thick tortilla and then points to the cinnamon and sugar to sprinkle on top. It is a delicious, melt-in-your-mouth treat, with no guilt. Hey, think of all the calories burnt while hiking through this wonderland! The campground has potable water and clean outhouses. Many of the campsites are shaded, and if you’re lucky you’ll land one next to Havasu Creek, which runs through the campground. Putting your feet in the water and looking up at the beauty around you trumps the air-conditioned room at the lodge. But if you aren’t much of a camper, you can stay at the Supai Lodge, back in the village at about mile 8. The light of morning arrives early in the canyon, and with it the sweet sounds of birds enjoying a new day. If you can muster the energy, more adventure awaits down the canyon. Less than a mile away is Mooney Falls, and three miles further is Beaver Falls. Fifteen minutes down the path a sign states authoritatively “DESCEND AT OWN RISK.” It doesn’t really seem to give anyone much pause. Most people who have made it this far like a bit of adventure in their lives. As you climb down the face of the cliff, there are steel chains and rods firmly placed in the rock, providing holds as you work your way down. A rickety wooden ladder precariously hangs from the wall to help the brave maneuver the last 20 feet toward the bottom. One little jump and both feet are planted firmly on the ground. And there she is — Mooney Falls! It’s the tallest of the Havasupai waterfalls; the water drops over 190 feet into a turquoise pool. Some adventurers, apparently, felt it was appropriate to “moon” Mooney Falls. Although I didn’t have that urge, I did take photos! Continuing on, the path traverses back and forth from one side of the canyon to the other, crossing Havasu Creek at several points. One part of the hike has a Jurassic Park feel — a narrow path winding through a valley of lush green vines at chest height. Just before reaching Beaver Falls there is one more challenge: scaling the side of the canyon on a small ledge to reach the first pool. It’s enough of a challenge to give you a thrill, but we all made it safely, from the 6-year-old girl to the 80-year-old man in our group. Beaver Falls is actually a series of cascades and pools, a great place to sit under one of the falls and let the water massage and invigorate your tired body while you feast your eyes on the pristine beauty around you. 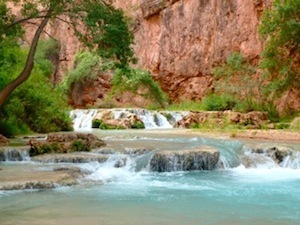 The Havasupai Indian tribe has lived in this paradise for over 800 years. Their land covers over 188,000 acres along the western edge of the Grand Canyon’s South Rim. Thankfully, they are willing to share its wonder with the rest of us! 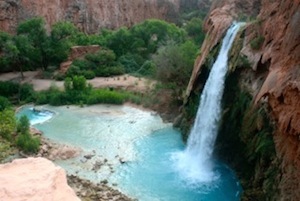 To plan your trip, here is a helpful website: http://www.havasupaifalls.net/. Three nights easily gives you enough time to hike in, enjoy this Garden of Eden in the desert, and then head back out. Grab some friends and head to the land of the Havasupai. Great experiences are even better when shared. And this is definitely one worth sharing.